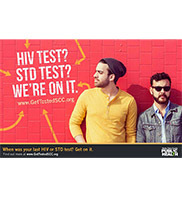 Through the Santa Clara County Social Marketing for HIV/STD Prevention project, JSI used a community-based social marketing approach as the strategic planning framework for developing outreach campaigns to promote HIV and STD testing in several target communities in Santa Clara County. Marketing techniques included social media, designs for print media, adoption and customizing of existing materials, and technical assistance to reinforce messaging and to counter barriers in reaching the target communities. Check out the social marketing campaign at JSI's Health Communication Portfolio as well as a photo essay of the campaign: HIV Test? I’m on it!” Using Social Marketing to Reach a Diverse Population in Santa Clara County, CA. View the campaign: I’m On It!